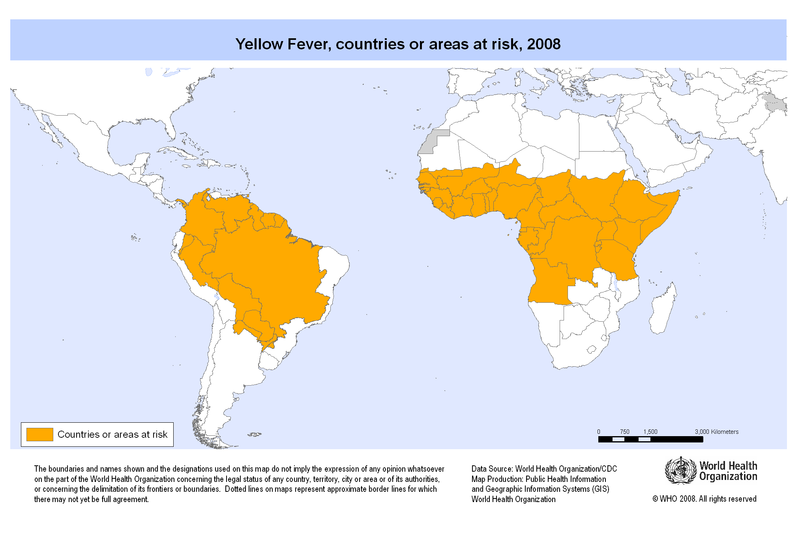 As of 31 January 2017 additional areas for which yellow fever vaccination is recommended for international travellers include: Bahia State:extension of the areas at risk for yellow fever transmission with the inclusion of the following municipalities in the south and south-west of the state da Bahia: Alcobasa; Belmonte; Canavieiras; Caravelas; Ilheus; Itacare; Mucuri; Nova Visosa; Porto Seguro; Prado; Santa Cruz Cabralia; Una; Urusuca; Almadina; Anage; Arataca; Barra do Chosa; Barro Preto; Belo Campo; Buerarema; Caatiba; Camacan; Candido Sales; Coaraci; CondeUba; Cordeiros; Encruzilhada; Eunapolis; Firmino Alves; Floresta Azul; Guaratinga; Ibicarai; Ibicui; Ibirapua; Itabela; Itabuna; Itagimirim; Itaju do Colonia; Itajuipe; Itamaraju; Itambe; Itanhem; Itape; Itapebi; Itapetinga; Itapitanga; Itarantim; Itororo; Jucurusu; Jussari; Lajedao; Macarani; Maiquinique; Mascote; Medeiros Neto; Nova Canaa; Pau Brasil; Piripa; Planalto; Posoes; Potiragua; Ribeirao do Largo; Santa Cruz da Vitoria; Santa Luzia; São Jose da Vitoria; Teixeira de Freitas; Tremedal; Vereda; Vitoria da Conquista. The determination of these extended areas considered to be at risk for yellow fever transmission is preliminary. Updates will be provided regularly by the World Health Organization. Copright © UNIVERTUR TRAVEL SERVICE All rights reserved.